The water splash patterns strongly depend on the surface conditions of the solid object. The present paper discusses the influence of the surface conditions of the solids falling into the water on the formation of the splashes, employing the experimental method with the high speed video camera and the numerical approach by the particle method. We propose two engineering models for calculating the Navier–Stokes flows to distinguish the different surface conditions of the solids falling into the water. One is to add the attractive or repulsive force between the water and the surfaces of the solids, and the other is to consider the swelling ratio as the slip condition, which causes the different wall shear stresses at the interfaces between the solids and the water. The above models are successfully employed to study the effects of the differences of the surface conditions of the falling objects on the splash formations. We have successfully calculated the splashes caused by the different surface conditions of spheres using the MPS method. Fluid Structure Interaction (FSI) is one of the most important themes in the computational mechanics and many related studies have been performed in the wide fields such as structures, vehicles, medicine and biomechanics (Idelsohn et al. , Saksono and Perić , Angeles et al. ). In the fields of biology and biomechanics, the studies of an aneurysm model by the groups of Takizawa et al. , an aneurysm or arteriosclerosis by Borghi et al. and Khanafer et al. and an interfere between blood and deformed vessel by Tallec et al. , Gerbeau et al. and Yokoyama and Mochizuki  have been performed among others. Regarding the relation with the bionics, there are some interesting researches of flow dynamics caused by creature [10–12]. Creatures living in water such as frog or fish have a slimy mucus skin, where the principal ingredient of the mucus is a hydrogel known as mucin . Kikuchi et al. investigated the flow near the hydrogel surface as a hydrophilic material, where they studied the slippery flow on the hydrogel surface and determined the relation between the strength of the hydrophilicity of hydrogel and the slip velocity on the hydrogel surface. One of the topics on the Fluid Structure Interaction related above is the mechanics of splash caused by creatures living in water. Manservisi et al. studies the interaction between a droplet and the surface of a wall and numerically simulated the spreading of a single droplet impacting over horizontal dry surfaces. Some focused on the contact angle of a droplet on a solid surface [16, 17], studying the surface tension related with the multiphase flow [18, 19]. Rebouillat et al. and Idelsohn et al. calculated the sloshing of a liquid filled partially in a container as problems of solid and fluid interaction. They used the Finite Element Method (FEM) to solve the flow with free surface with large deformation and many droplets. Alam et al. indicated that the surface tension of a splash becomes prominent with small-scale phenomena. The milk crown formed by a droplet falling into milk was studied by several researchers [23, 24]. The splash by splining sphere was studied by Truscott and Techet . Kubota et al. 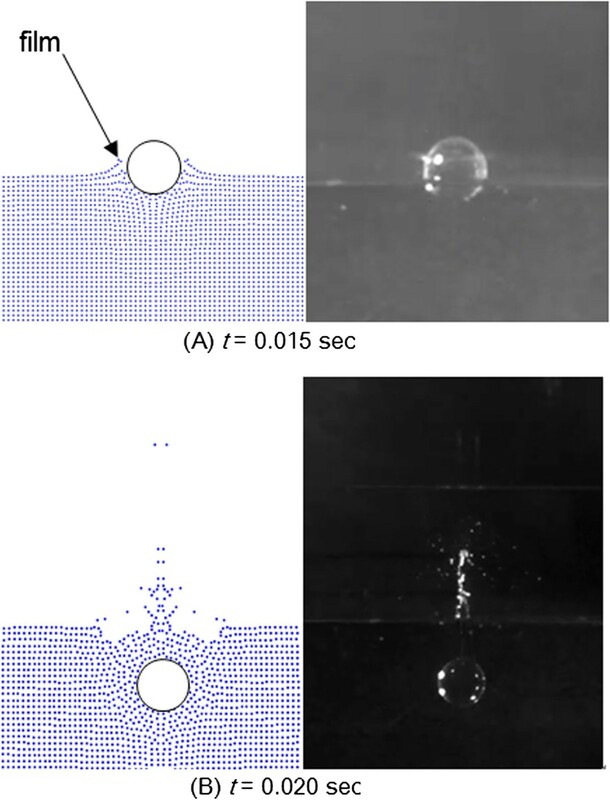 experimentally observed different splash patterns due to the different impact speed of a solid sphere impinging on the surface of water. Bussmann et al. studied the formation of the finger at the edge of water film. Akers et al. studied the influence of the non-Newtonian fluid on the splash formation, focusing on the property of water. Duez et al. reported the relation between the splash formation and the sound generation, studying the effect of the hydrophobic or hydrophilic surface of the body on the mechanism of the splash. Some studies were reported on the splash and the droplet dealing with the free surface flow employing the particle methods [30–33]. However, most of the above researches, assuming the non-slip condition at the solid–fluid interface, have ignored the effects of the surface properties of the solid on the results. 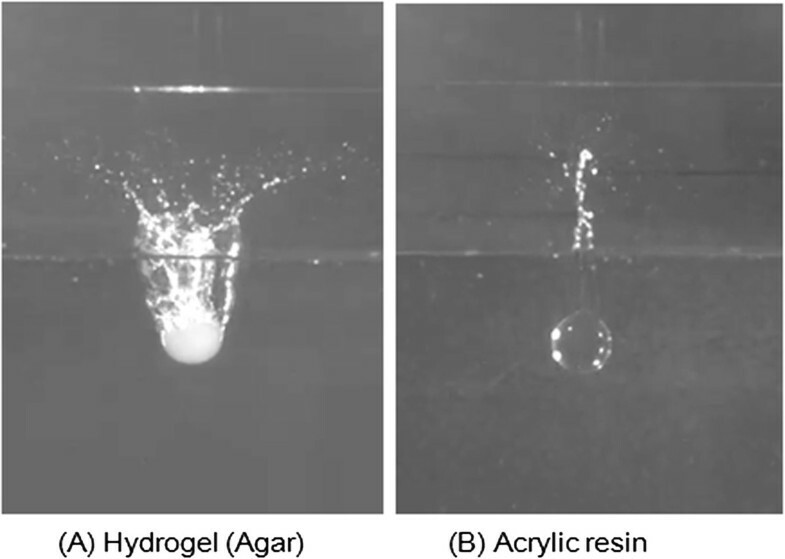 The need to consider the surface properties in the splash formation can be seen in the experimental results as shown in Figure 1, where Figure 1(A) shows the crown-type splash generated by a hydrophilic object (hydrogel) and Figure 1(B), on the other hand, the column-type splash generated by an object of the weaker hydrophilicity (acrylic resin). The comparison of these figures shows that the splash patterns strongly depend on the surface conditions of the solid object. 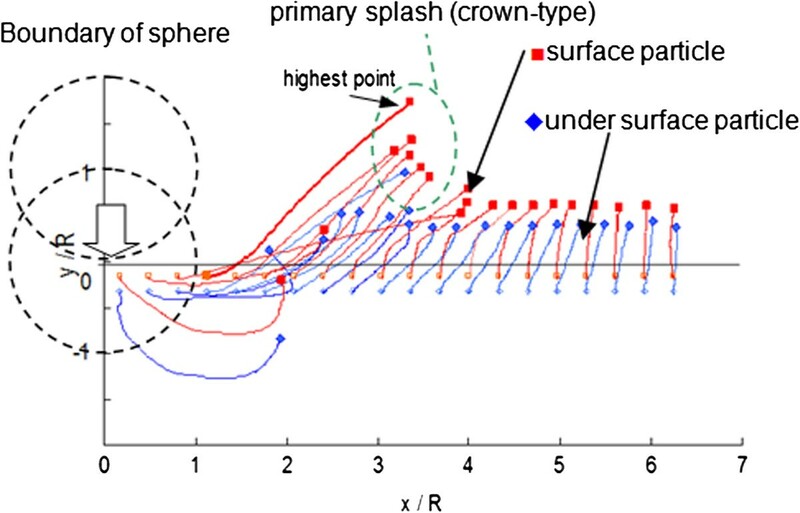 It is noted that the fact that the forms of splash caused by a solid sphere with the same weight and the same diameter differ according to the surface condition is not known in general. Experimental comparison of splash patterns between hydrogel and acrylic resin; Radius of sphere = 10 mm and Impact velocity = 2.21 m/sec. In the present paper, a model for calculating the flow on the special boundary condition such a slip on biological surface or an electrical attractive/repulsive force of resin is proposed and applied it to the splash simulation. An experiment on the splash generated by a diving sphere with different surface conditions is performed to observe the influence of different surface conditions on the splash formation, where we use the diving sphere made of agar as the hydrophilic material. The agar is a kind of hydrogel like gelatin, and known to be easy to control its water content and to create arbitrary shape. For example, Eddington et al. reported the use of the hydrogel as the valve for flow control of a microchannel, and Beebe et al. discussed the effectiveness of hydrogel structure for flow control on micro fluidic channels. The test condition is as follows: the radius of a sphere R is 10 mm, the initial height h is 50R, and the impact velocity of the sphere at the water surface Vi is 2.4 m/s. The impact velocity is determined according to the conservation of energy, because the air drag is negligible for the range of heights in this study. The dynamic views of the splash are recorded by using a high speed CMOS camera (Vision Research Inc., Phantom v7.1), where the camera is set as 4000 frames per second so that precision timing between consecutive images is 0.25 ms. The experimental results of a splash formed by a sphere impinging on water surface are shown in Figure 1, comparing the primary splash formed by a hydrogel sphere (Figure 1(A)) with that by an acrylic sphere (Figure 1(B)). The primary splash means the splash, which rises first after an object plunging. The primary splash formed in the case of the hydrogel is a kind of the crown-type. On the other hand, the acrylic sphere makes the column type primary splash. The splashes are considered to be formed by the dynamics of the film-flow , which is a thin water flow around a sphere surface and generated immediately after the sphere impacts the water surface. The difference between the formation processes of Figures 1(A) and (B) is due to the difference of the film separation from the sphere surface. When the film is separated from the sphere surface, a crown-type splash is formed. The above film separation is presumably caused by the increase in the film velocity according to the hydrophilic property of the solid wall and the attractive or repulsive force such as the electrostatic force between the solid wall and the water. This experimental observation suggests that the numerical simulation should take into consideration the various surface conditions as the interaction between the object and the water. where u is the velocity vector of fluid, ρ is the density of fluid, P is the pressure, ν is the kinematic viscosity of fluid and F is the external force including the gravity. Here, r is the distance between two particles and re is the cut-off radius. ii) The Poison’s equation is solved at the implicit calculation stage to solve the pressure p. Then, the velocity u* is modified with p solved above in order that the particle number density within a domain is conserved. Finally, u* is added to u- to obtain the target velocity u at t.
iii) The time step is updated as t = t + dt, where dt is set 0.001 sec in the present paper. We discuss here how we introduce the influence of slip in the horizontal direction on the hydro-gel wall into the calculation, which is a heuristic approach. Schematic views (Left) and experimental results (Right) of flow profiles near no-slip wall (acrylic resin) and slippery wall (hydrogel) []. where β is estimated to be 1.2 × 10-3 in the case of the agar. It is summarized that larger S gives more slip on the surface. 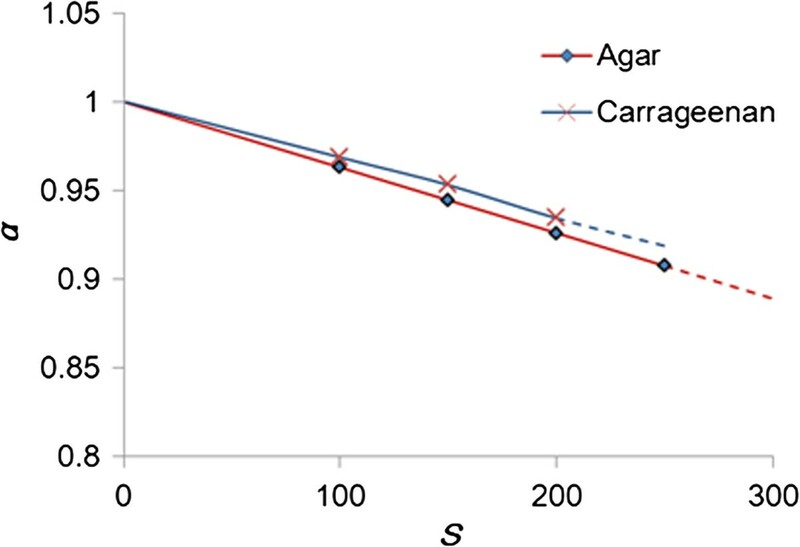 Experimental relationships of slip ratio α versus swelling parameter S .
where index i denotes the water particle near hydro-gel wall and j the surface particle of hydro-gel wall. Namely, α is set effective only near the hydrogel wall, because the effect of slip is available near this area. The effective length of the above reduced weight function near the wall is assumed to be re in this study, and set to be 2.1l0 , where l0 is the initial distance between the particles. Summarizing the above procedure, i) select S according to the hydrophilicity of the solid object, ii) estimate α using Eq. (7), and iii) apply α to the weight function of viscous term of Navier–Stokes equation for the calculation of shear force near the hydrogel wall using by Eqs. (8) and (9). In order to simulate the column-type splash, which occurs in the case of acrylic resin sphere, a model of the external force F is discussed here, which is the attractive or repulsive electrostatic force on the interface between water and the wall. Here, we propose a heuristic model of the force acting between water molecules. where qi and qj are the electric charges and rij is the distance between the particle i and j. In the present study, we assume the case of water, namely, the electric charge qi and qj = 1.6 × 10-19 [C] , and the vacuous dielectric constant ϵ0 = 8.854 × 10-12 [F/m]. The effective range from the wall of TE is assumed to be equal to be re, which is 2.1l0. In the present paper, the behaviors of the fluid when the solid sphere is dropped into it are simulated with the MPS under the following conditions: The fluid is assumed to be water, namely, its mass density ρwater is 1000 kg/m3. The radius R of sphere is 10 mm and the impact velocity of the sphere is 2.4 m/s, which are the same as the experimental setup described in Section Experimental observation. The particles for the simulation are uniformly arranged in the lattice pattern and the initial distance between particles l0 is set 4 × 10-3 m after some test. The cut-off radius re is set to be 3.1 . Because these values, l0 and re, give influence on the result, we compare the dependency of l0 and re to confirm the consistency and the convergence on the solutions in what follows. Figure 4 shows the comparison of the crown-type splash patterns with different values of re. The patterns of splash are almost the same between re = 3.1 and 4.1, then we set re = 3.1 in this paper. Figure 5, on the other hand, shows the snapshots of the crown-type splash with different values of l0. Since the simulation results with l 0 = 2 × 10-3 m and l 0 = 4 × 10-3 m are similar and compared well with the experimental result, we have decided to employ l 0 = 4 × 10-3 m in the present simulation. Effect of value of r e on crown-type splash. t = 0.035 sec and S = 100. Effect of value of l 0 on crown-type splash. t = 0.03 sec and S = 100. Both the width and the depth of the water tank are 20R, which are set to be sufficiently large so that the effects of the size of these are negligible. The boundary condition of the tank’s wall is no-slip condition with 3 lattices of solid particles. The regular time step of this calculation is set to be 1 m sec, but it is controlled automatically according to the Courant conditions. The simulated pattern of the collapse of the water column is compared with the experimental result , confirming that its behavior is similar to that of the experimental result. The sphere is assumed as a rigid body, which sinks due to the gravity and the buoyancy, but the rotation of the sphere is not considered as its effect on the solution could be very small. The surface tension is not considered either in the present calculation, which will be an issue to be discussed in the future study. As the behavior of the splash directly depends on CE, the influence of the parameter on the formation of the splash is discussed here. Figure 6 shows the path lines of a particle, where the tip of primary splash is plotted for the various values of CE in the case of a sphere made of the acrylic resin. It is seen from the figure that the particle, creating the film, moves upward along the surface of the sphere when the value of CE is 3000 or over. On the other hand, when the value of CE is smaller than this value, no film-flow appears and the exfoliation of water particles causes the crown-type splash, which is not observed in our experiment with the acrylic resin. Thus, we presume that there works a kind of electrostatic attractive force between the sphere made of the acrylic resin and the water. Path lines of particles for various values of C E .
Figure 7 compares the results of the simulation in the case of CE =5000 with the experimental results. 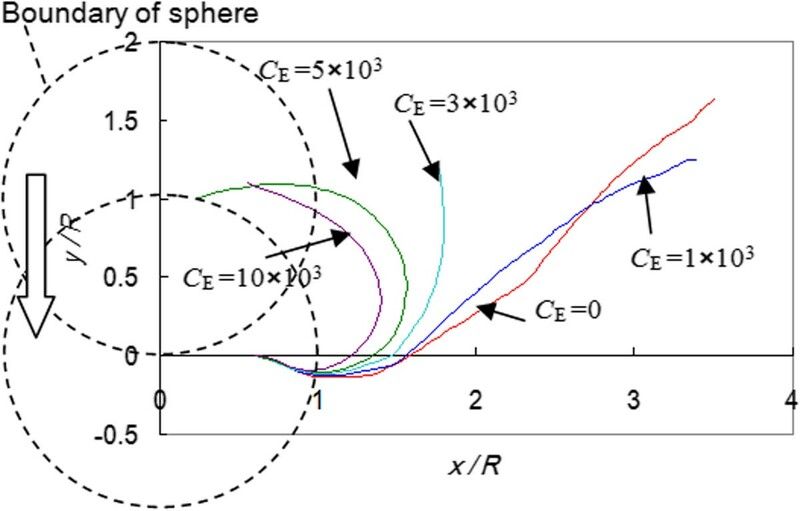 Figure 7(A) shows the film flow rises up along the sphere at t = 0.015 sec. Comparison between simulation and experiment for acrylic resin sphere (C E = 5 × 103). As shown in the left hand side of Figure 7(B), the primary splash by the numerical simulation at t = 0.020 sec is column-like, which is similar to the experimental result shown in the right hand side of the same figure. In the case of the column-type splash caused by the acrylic resin, the water flow does not exfoliate and the film flow rising up along the surface of sphere, which is considered to create the column-type splash. Thus, it seems appropriate to set the value of CE to be 5000 in the case of the acrylic resin. Although the unphysical numerical oscillation of pressure has been reported with the use of the MPS [40, 41], this is found very small as far as the present simulation is concerned with any particle arrangement tested. 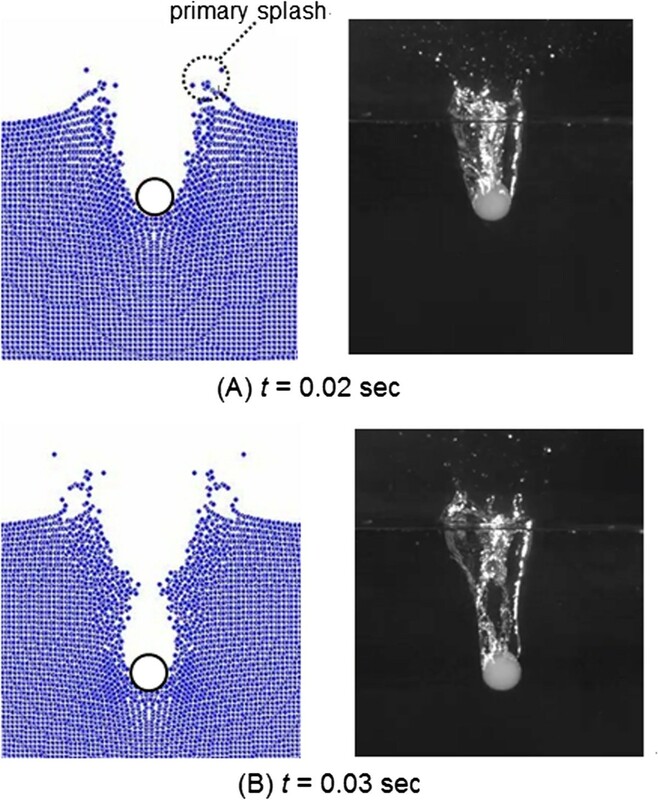 The reason may be due to the fact that the present splash simulation is related with the behavior of the free surface and the droplet in the air and the time duration is rather short. As we have discussed in Subsection 3.2, the effect of the slip ratio α on the flow around a hydrogel sphere could be taken care with Eq. (8). The comparison of the simulation result with S = 100 and the experimental one is shown in Figure 8, where the effect of the attractive force discussed in the previous Subsection is not considered and the radius of sphere R is 10 mm and the initial height h is 50R in the both simulation and experiment. The width and the height of the splash and the fusiform air cavity are compared well between the simulation and the experiment as shown in Figure 8(A). The hourglass cavity is also simulated well as shown in Figure 8(B). Comparison between simulation and experiment for hydrogel sphere ( S = 100). Figure 9 shows the crown-type splash and the path trajectories of particles for the different swelling ratios. The dotted solid lines are the path trajectories of particles when S is 50 or α = 0.94, whereas the dotted lines those when S is 350 or α = 0.7. It is seen from the figure that the splash is wider with larger value of S or α, or the velocity of the water near the wall is larger with the swelling ratio, which causes the earlier exfoliation, creating the wider primary splash. Comparison between simulation results of representative path lines of water particles, showing path lines of primary splash for hydrogel spheres of different values of swelling parameter S .
It is known difficult to observe experimentally which water particles originally stored in a tank cause the primary splash. Since the seed particles in the water are mixed with the air bubbles of the splash, it is almost impossible to trace the movement of them in an experimental environment such as PTV. Figure 10 shows the path lines of some ten representative particles, which are originally located at the surface or near the surface of water at t = 0, when the falling object touches the surface of the water. This figure indicates that the water particles, which are originally located near the surface of the water and under the falling sphere, become the primary splash and after exfoliating from the surface of the sphere, form the tip droplet of the crown-type splash. Path lines of particles making primary splash ( S = 100). 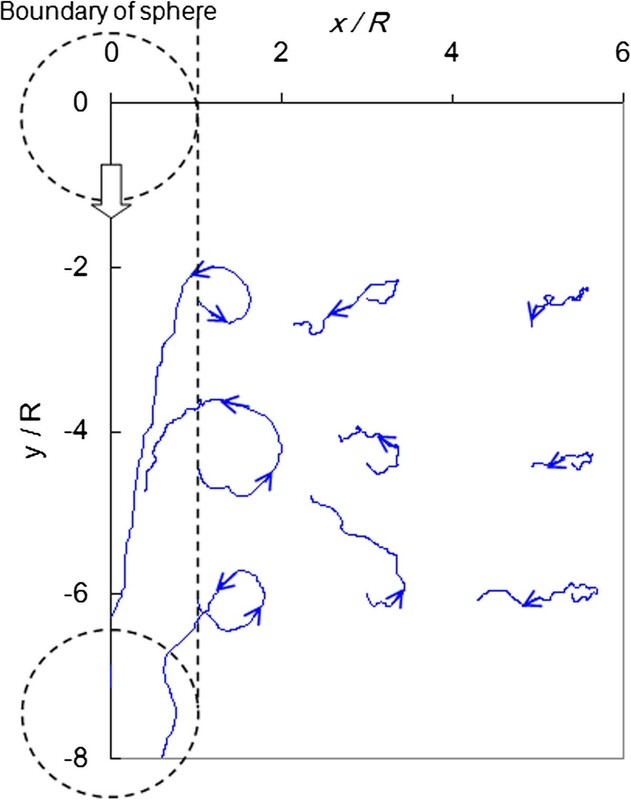 The flow induced by the crown-type splash of the hydrogel sphere is shown in Figure 11, where the path lines of representative particles are depicted between t = 0 to 0.5 sec. while the sphere sinks in a water tank after plunging to the surface of the water. The arrows of the path lines indicate the direction of the moving particles. It is seen from the figure that the particles turn around and return to their initial positions and the loci of the particles located near the contact point draw a larger circle compared with those of the particles far from the contact point. Representative path lines of water particles in tankxx. 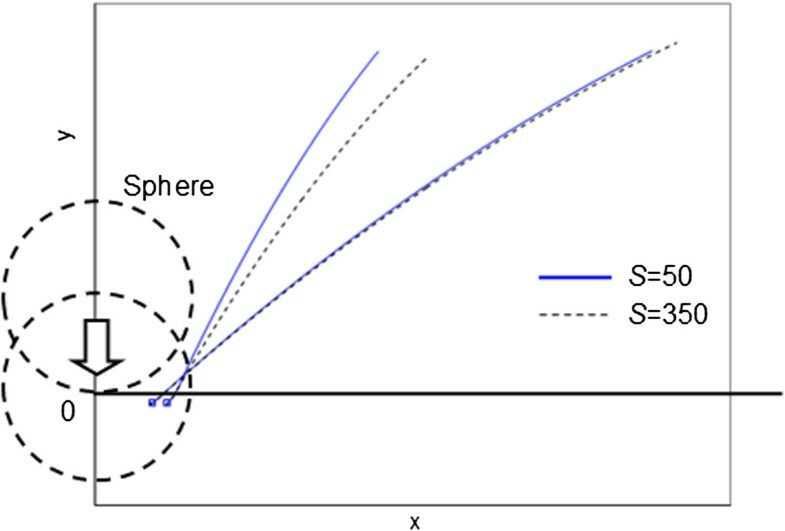 Proposed in the present paper is a new method to calculate the formation of a splash induced by a spherical object diving into water. Considering the difference of surface condition, we calculate the splash generated with a sphere by the MPS method, where the attractive force is applied to the particles located at the interface between the falling object and the water, and the swelling ratio is introduced to simulate a slip condition. The numerical results of a diving sphere made of the acrylic resin or made of the hydrogel are in good agreement with the splash forms by the experiments. Due to the effect of the attractive force between the wall and the water, it is seen that the water film climbs along the surface of the acrylic resin sphere. Using the slip ratio according to the magnitude of the swelling, which is the ratio of the total mass to that of the agar, the formation process of the water splash is investigated, finding that the hydrophilicity affects the shape of the crown during the water splash phenomenon and the velocity of the water near the wall is larger with the swelling ratio, which causes the earlier exfoliation, creating the wider primary splash. The simulation result shows that the particles of the water under and near the location, where the sphere plunged, become the droplets of the primary splash and that the particles of the water near a sinking sphere move around their initial positions in a circular manner. This research was supported by the MEXT supported Program for the Strategic Research Foundation at Private Universities, 2012–2017 and the WCU (World Class University) Program through the Korea Science and Engineering Foundation funded by the Ministry of Education, Science and Technology (R33-2008-000-10027-0). MY and GY are among the simulation team. YK, KK and OM are members of the experimental team. All authors have read and approved the final manuscript.